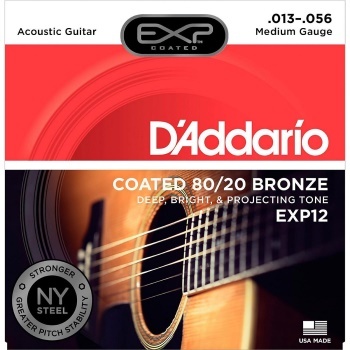 D'Addario's heaviest 80/20 Bronze gauge, EXP12s offer heavier tension resulting in a bolder, more resonant acoustic tone with higher resistance for heavy strumming and flat-picking. D'Addario EXPs are the most natural-sounding, longest-lasting coated strings available. EXP Coated Technology starts with the highest quality wrap wire materials, precision drawn and micro-coated on our advanced proprietary machinery. Strings are then wound normally, delivering tone and feel identical to D'Addario's world renowned acoustic strings, with a minimum of 4 times more life. You won't believe they are coated!